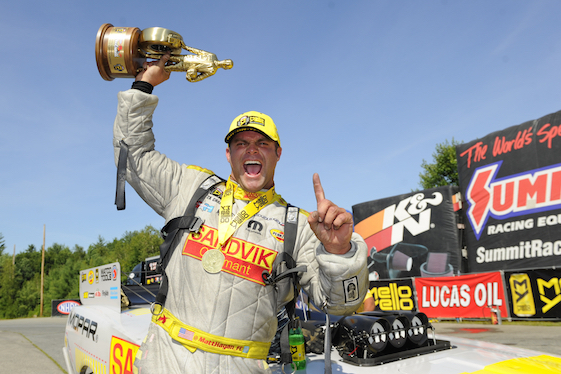 Funny Car driver Matt Hagan carted away his second straight Funny Car Wally when he won the New England Nationals. Two-time Funny Car world champion Matt Hagan claimed his second consecutive Wally trophy of the season Sunday with a final-round victory at the sixth annual NHRA New England Nationals in Epping, N.H.
Steve Torrence (Top Fuel) and Chris McGaha (Pro Stock) also emerged as winners in their respective categories before a sellout crowd at New England Dragway during the 13th of 24 events on the 2018 NHRA Mello Yello Drag Racing Series schedule. Sellout crowds Saturday and Sunday in Epping raised the season’s total to seven sessions. Hagan powered to the winner’s circle with a 1,000-foot run of 4.156-seconds at 292.01 mph in his Dodge Charger R/T to trailer Tim Wilkerson’s 4.181-second pass at 287.35 mph in the Levi, Ray & Shoup Ford Shelby Mustang. Hagan secured his third win in 2018 and now has posted back-to-back victories at New England Dragway. The win also was the 29th of Hagan’s career. “We’ve just got a good race car. We were the No. 1 qualifier and this car just continues to go down the track,” said Hagan, of Don Schumacher Racing. Hagan gained almost 100 points on category leader Courtney Force of John Force Racing during the weekend. “I think the biggest thing is (crew chief) Dickie Venables,” Hagan said. “The guy is smart. If you give him enough runs and enough opportunities at whatever it is, he’s going to figure it out. I think that’s why he’s been in the sport for over 50-some years. He’s been doing it since he was hanging on his dad’s leg. He’s somebody that I want to keep myself around as long as possible. He works hard, this is his life and it goes to show on the race car. Hagan eliminated Terry Haddock and DSR teammates Tommy Johnson Jr. and Ron Capps, the 2016 world champion, on his way to victory. Wilkerson qualified ninth and defeated J.R. Todd, 2012 world champ “Fast” Jack Beckman and Shawn Langdon as he reached his first final of the season. Torrence notched his fifth victory of the year by beating three-time world champion Antron Brown of DSR in the Top Fuel final. Torrence covered the 1,000-foot distance in 3.909-seconds at 320.74 mph to Brown’s 3.948-second pass at 315.12 mph. The class point-leader, Torrence earned his first career win in Epping. Torrence, who qualified third, defeated Dan Mercier, Shawn Reed and eight-time world champ Tony Schumacher of DSR en route to victory circle. Brown qualified 12th and bested Clay Millican, reigning world champion Brittany Force of JFR and No. 1 qualifier Leah Pritchett to reach his first final round of 2018. McGaha took the win in Pro Stock by covering the traditional quarter-mile in 6.570-seconds at 211.10 mph in his Chevrolet Camaro SS as Erica Enders red-lit/fouled-out. McGaha secured his second win of the season and first since the event near Phoenix to become the fourth “Factory Hot Rod” driver to record multiple victories in 2018. Enders, a two-time world champ, qualified second and defeated Alan Prusiensky, Matt Hartford and Vincent Nobile before facing McGaha. Enders’ fifth runner-up result of the season allowed her to overtake Anderson for the class lead by 16 points. The season will continue at Bandimere Speedway in Morrison, Colo., near Denver, from July 20-22 as the first of three races in the annual summertime Western Swing. Top Fuel _ 1. Steve Torrence; 2. Antron Brown; 3. Leah Pritchett; 4. Tony Schumacher; 5. Brittany Force; 6. Shawn Reed; 7. Doug Kalitta; 8. Richie Crampton; 9. Terry McMillen; 10. Mike Salinas; 11. Dan Mercier; 12. Dom Lagana; 13. Jim Maroney; 14. Clay Millican; 15. Scott Palmer; 16. Audrey Worm. Funny Car _1. Matt Hagan; 2. Tim Wilkerson; 3. Ron Capps; 4. Shawn Langdon; 5. John Force; 6. Jack Beckman; 7. Tommy Johnson Jr.; 8. Robert Hight; 9. J.R. Todd; 10. Jonnie Lindberg; 11. Cruz Pedregon; 12. Courtney Force; 13. Bob Tasca III; 14. Jim Campbell; 15. Terry Haddock; 16. Jeff Diehl. Pro Stock _1. Chris McGaha; 2. Erica Enders; 3. Vincent Nobile; 4. Kenny Delco; 5. Greg Anderson; 6. Jason Line; 7. Matt Hartford; 8. Drew Skillman; 9. Jeg Coughlin Jr.; 10. Alex Laughlin; 11. Bo Butner; 12. Alan Prusiensky; 13. John Gaydosh Jr.; 14. Val Smeland; 15. Fernando Cuadra; 16. Tanner Gray. Top Fuel _ Steve Torrence, 3.909-seconds, 320.74 mph def. Antron Brown, 3.948-seconds, 315.12 mph. Funny Car _ Matt Hagan, Dodge Charger, 4.156, 292.01 def. Tim Wilkerson, Ford Mustang, 4.181, 287.35. Pro Stock _ Chris McGaha, Chevy Camaro, 6.570, 211.10 def. Erica Enders, Camaro, Foul/Red Light. Super Stock _ Anthony Bongiovanni, Ford Mustang, 8.461, 158.24 def. Tom Boucher, Pontiac Firebird, 9.571, 138.19. Stock Eliminator _ Randi Lyn Shipp, Pontiac Firebird, 10.548, 119.12 def. Howie Smith, Chevy Malibu, 11.938, 106.81. Super Comp _ Mike Robilotto, Dragster, 8.935, 172.78 def. Timmy Markoglu, Dragster, 8.902, 182.97. Super Gas _ Ken Bowers, Chevy Corvette, 9.919, 162.49 def. Justin Lopes, Chevy Nova, 9.943, 166.09. Super Street _ Peter Maduri, Chevy S-10, 10.907, 142.39 def. Brian Sawyer, Chevy Camaro, 10.881, 143.29. Top Dragster presented by RacingRVs.com _ Deborah DiGenova, Dragster, 6.802, 194.60 def. Rebecca Miller, Dragster, 6.844, 193.99. Top Sportsman presented by RacingRVs.com _ Dave Testa, Chevy Corvette, 7.221, 189.31 def. Brian Conrey, Corvette, 6.965, 197.65. Top Fuel Harley _Doug Vancil, Weekend, 6.283, 222.44 def. Jay Turner, Dixie, 6.487, 191.57. Pro Stock Snowmobile _ Tiina Duncanson, Ski-Doo, 8.269, 155.69 def. Brian Garbus, Yamaha, 8.345, 152.23. FINAL _Torrence, 3.909, 320.74 def. Brown, 3.948, 315.12. FINAL _ Hagan, 4.156, 292.01 def. Wilkerson, 4.181, 287.35. FINAL _ McGaha, 6.570, 211.10 def. Enders, Foul/Red Light. Top Fuel_1. Steve Torrence, 1,086; 2. Tony Schumacher, 896; 3. Clay Millican, 881; 4. Leah Pritchett, 820; 5. Doug Kalitta, 801; 6. Antron Brown, 717; 7. Terry McMillen, 679; 8. Brittany Force, 634; 9. Richie Crampton, 522; 10. Mike Salinas, 506. Funny Car_1. Courtney Force, 1,069; 2. Matt Hagan, 914; 3. Jack Beckman, 847; 4. Ron Capps, 834; 5. Robert Hight, 829; 6. J.R. Todd, 800; 7. Tommy Johnson Jr., 692; 8. John Force, 632; 9. Shawn Langdon, 614; 10. Bob Tasca III, 564. Pro Stock_1. Erica Enders, 936; 2. Greg Anderson, 920; 3. Tanner Gray, 917; 4. Vincent Nobile, 893; 5. Drew Skillman, 808; 6. Chris McGaha, 803; 7. Jeg Coughlin Jr., 766; 8. Bo Butner, 750; 9. Jason Line, 680; 10. Deric Kramer, 659.